Idea: Filtering - Export/import multiple filter settings? Hi - The actual functionality allows a user to save the settings for only one Omniscope filter at a time, creating a separate exportable/importable XML file with the filter configuration. Because normally a model/scenario needs to impose/return several pre-defined filter settings at a time, I suggest adding a new option to allow a user to save in one operation a selection of filters, naming the combined/shareable XML file with the name of the model or scenario. This would also be useful for saving/returning a file to the 'official' settings of all the filters on a tab or view or by groups. Do you mean filters or variables? 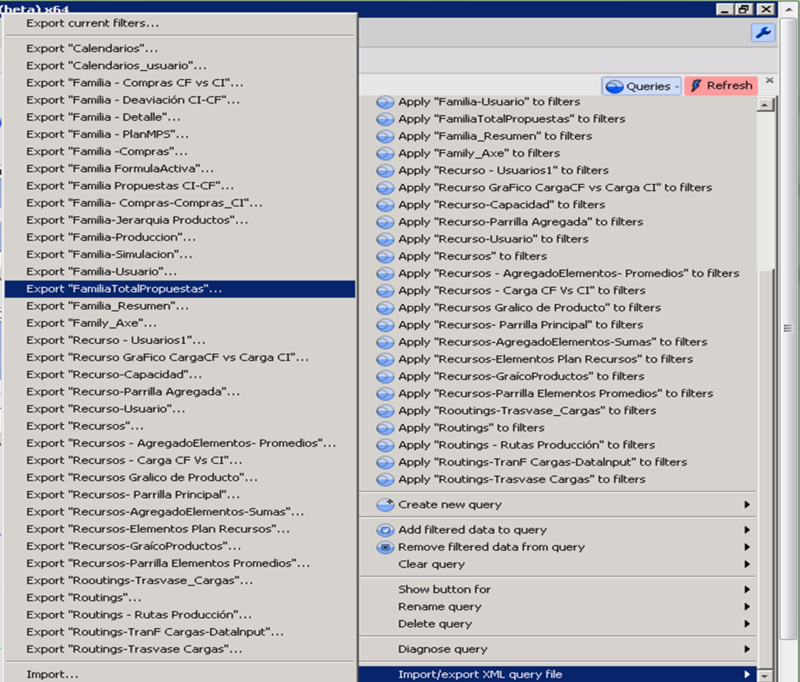 Filters can be captured as "Queries" using the queries menu and from there can be restored, and also exported or imported as XML. You can also use "Commit" and "Revert" to create a save point for each tab. Does this solve your requirement? - Import: In The import process, Can you allow the possibility to select some (1.n) xml files at the same time, simplifying the filters upload?. OK, you mean exporting/importing in bulk? For example, you would tick "Calendarios" and "Calendarios_usuario" and get two files? Likewise, for import, the ability to select multiple files to be imported as separate queries. We've fixed the query menu - from the next 2.8 build, you'll see more of the query name displayed, with a tooltip on hover for the full name.